Playing with embroidery stitches is Good for You. When you allow yourself to dabble about and play with stitches, you learn a lot! Besides learning just the construction of a stitch, you learn how to be really comfortable with it, how to mix it up, how to combine it with other stitches, how to expand the possibilities of the stitch. There are other advantages to playing with stitches: it opens up new possibilities for your own projects, it gets your creative juices flowing, it gives you new ideas on color and texture combinations. Oh yes. I’m a huge Advocate of Playing with Stitches. That’s why the Stitch Fun! series came about, and that’s why I encourage stitchers to indulge in random stitch samplers and doodle cloths. Lately, I’ve been playing with needle-woven fillings. Needle woven embroidery stitches are super-duper easy ways to fill areas of embroidery with different textures, patterns, and color. 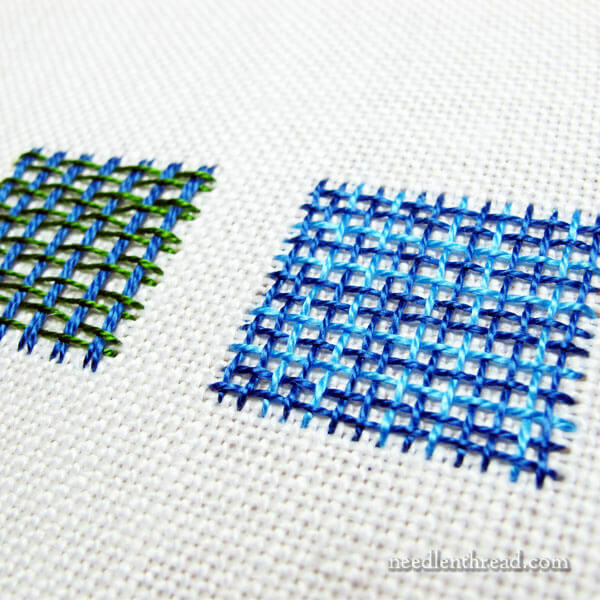 The basic concept of a woven filling stitch is simple. 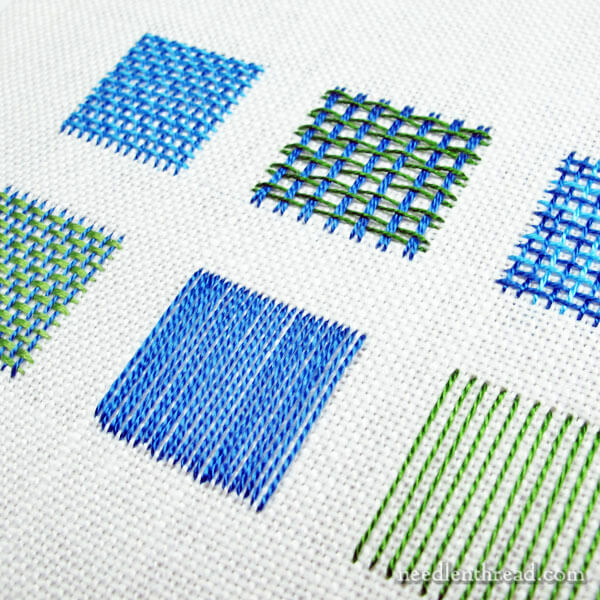 You can find a step-by-step tutorial for the basic woven filling stitch here. Essentially, you create a “warp” with vertical straight stitches, and then you weave horizontal “weft” threads into those vertical stitches. Woven fillings can be used for all kinds of embroidery applications. One of my pet projects involving woven filling is the Lavender Honey design in my Little Things e-book. The beehive is worked in a woven filling. But you can think beyond basket-type textures for woven fillings, too. Clothing on embroidered people can be stitched with woven fillings. Large spaces in stylized floral motifs or Jacobean or crewel designs can be filled with woven fillings. If you’re familiar with Hazel Blomkamp’s embroidery (she wrote Crewel Twists and Crewel Intentions, both of which I’ve already reviewed), she’s a master at using woven and couched lattice-type fillings to great advantage in her fantastic Jacobean-esque designs. So, in playing with my little sampler of woven fillings, I’m exploring mostly patterns, formed either by the sequence of weaving or by the color placement and spacing of both the warp and weft threads. It’s amazing how diverse needle weaving can be! The point of my little sampler – which consists of nine blocks of approximately 1″ square – is to show how just a tiny variation in the warp or weft threads can create a whole new filling. Take that further, working with more adventurous variations, and the sky’s the limit! The concept of needle weaving is a veritable amusement park where you can indulge in hours and hours of stitch exploration! Of course, for some of us, this could be dangerous. I get stuck into this type of playing, and everything else stitchy seems dull by comparison. It’s the roller coaster vs. the merry-go-round. It’s a thrill addiction. I’ll share more with you on needle weaving down the road a bit. If you’re up for some stitch fun this week, though, why not try a bit of needle weaving? It’s a blast! You can find my tutorial for basic woven filling here. For further stitch exploration, drop by the Stitch Fun! index, where you’ll find enough stitches and stitch combinations to keep you busy for years. You can also find over 75 video tutorials for embroidery stitches here on Needle ‘n Thread. If you’re looking for books on stitches, you’ll find many stitch dictionaries reviewed, in detail, in the Books section of Needle ‘n Thread. If you want to see how stitches can be combined for fun results, you might enjoy my Stitch Sampler Alphabet e-book, which is essentially the concept of Stitch Fun! worked out in an alphabet. I like playing about with stitches and looking at the stitch fun series and the How-to videos especially when I am stuck for ideas on what stitch to use. I’ve looked at all 75 videos and I’ve learned a lot on the various stitches and how to use them. I really liked making the Lavender Honey design especially the woven beehive it was my favourite out all the the Little things. I love your woven filling sampler and I can’t wait to see what surprises are in store for us and it is addictive when you play around with stitches, nothing better. Thanks for sharing your thoughts on playing with stitches especially woven ones look forward to more of this. That reminds me of a pleasant little experience when I was teaching children one summer. Our classes were 1.5 hours long, broken into two sessions with a little break in the middle of the session. During the break, I gave them a snack – just a cookie and some some water or juice – and sent them outside to play a bit. One little girl put the cookie in her pocket for later. In the middle of the next session, unbeknownst to me, she took a bite. Okay, this story made me laugh out loud! Oh my, I never once considered any type of stitching like this before. And with my love for historic stitching, the Jacobean part definitely caught my eye! Thank you for all the references! A new book from Hazel Blomkamp, right on the topic, is to be published quite soon : Needle Weaving techniques for hand embroidery (she annouces it on her blog). I love the story of the little girl “squirreler” although it did remind me of a time when my then teenage daughter would squirrel cans of food (soup, beans etc) half eaten in her wardrobe. We still do not know why and I don’t think she does either, but that’s kids. I love the needlelace stitching too. It is something I want to do on tulle but really don’t know how to start. Any suggestions? Next Next post: I Spy with my Little Eye – or do I?